When it comes to the weekend, you can sometimes do yourself a favour by looking back on the things that went right – ignore everything else. The same is true with live-action trailers: of course they’re mostly tosh, but what about the ones that aren’t? What about the times that, against the odds, PC gaming was successfully processed into cinema? Catch up on last week’s show, where we ran through the finest Final Fantasys (Fantasies?). 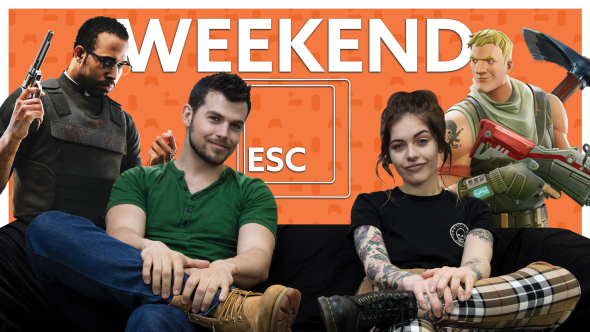 The new Weekend Esc celebrates not only that but the latest in gaming news, too. The nearly 5,000 years of Fortnite streamed on Twitch in the course of two weeks. The Far Cry 5 prequel now available to stream on Amazon Prime. And the fact that Final Fantasy XV was cracked even before it launched. Maybe that last one’s not to be celebrated, exactly, but the ingenuity of crack groups is certainly something to behold. Then there’s this week’s giveaway – two dragon figurines courtesy of MSI, and a blow-up sword and shield to keep them in check with. If you’re interested, simply complete one or more of the actions in the widget below. Complete more than one and you’ll have better odds of winning. We ask for an email address, but not for anything nefarious – just so we know how to contact you if you bag that prize. That’s everything! Just remember to watch the Weekend Esc every week, and to keep your blow-up weapons and gear topped up with air at all times.